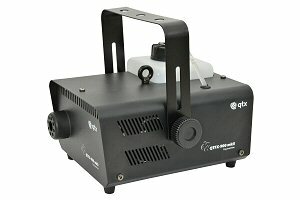 The QTFX-900 mkII is a great little smoke machine with good reliability in a low price range. Suited for mobile discos, bands and house party’s. Comes with wired or wireless remote control. Patented coating inside pipework helps to avoid jams caused by residue build-up and an auto cut-off circuit protects the machine when fluid level is too low. Digital temperature control system maintains a high operating temperature for shorter re-heat times, delivering a high volume of fog output with reliable and efficient flow from a relatively compact and discreet housing.